This work is part of a collaboration with the People of the British Isles project, funded by the Wellcome Trust. It was presented at the Royal Society's Summer Science Exhibition in 2012. What are the facial features that we inherited from our parents and ancestors? 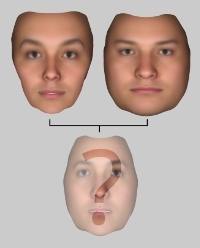 The study of faces is important in many areas such as genetic studies to link certain genes to craniofacial disorders, finding missing people by predicting what they should look like, and identification in various scenarios. Some characteristic features we have known for quite some time, like the upturned nose, hook nose, cleft chin (dimple chin), etc. ; other features still remain unknown. By discovering more and more such features we can study in increasing detail the variation of face shapes. This research project studies the variation of shape of the human face from portraits that have been captured in 3D. Capturing in 3D gives a unique opportunity to describe the actual shape of faces and their attributes in a way that is impossible from regular "2D" photos. In particular we are interested in how the computer can learn to discover heritable features. J.R. Tena Rodriguez, 3D Face Modelling for 2D+3D Face Recognition. PhD thesis, 2007. P. Koppen, C.H. Chan, W.J. Christmas, J. Kittler, An Intrinsic Coordinate System for 3D Face Registration. ICPR, 2012.